If you remember the Ice Warriors, you're probably one of those Doctor Who fans with a long memory, and no particular beef with black and white TV - like all those old songs that were huge in their day, but now only turn up on late-night music video shows catering to stoned college students watching at 2am saying "Yeah, I remember Bros! What happened to them?". The Native Martians - to give them their proper name, which even they never really used ("Ice Warrior" was a name Victoria, one of the second Doctor's companions, made up, but evidently they liked it so much they kept it) - had a rock star debut... then just kind of faded into the background. Mind you, they've almost come back a few times, but some kind of pesky jinx (not Halle Berry) follows them around: when they were to return to harass the sixth Doctor the show was put on hiatus during the season they'd have done so in, and when plans were made for them to come out of hibernation to get apocalyptically Xanatos Gambitted by the seventh - who was fond of that sort of thing - the whole show got cancelled. Fans would like to see them make a return in the new Doctor Who, but it may not be worth the risk. "We do not need an army. Earth will be ours for the taking - very soon..."
Mind you, at least there are people who do want them back, which puts them one up on Bros at any rate - back in the day, the Ice Warriors were quite the thing. The day was 1967, of course, so allowances have to be made for the costume, although it must be said the big guys fared rather better than most. Originally conceived as a cyborg race, their look was rethought for fear of making them resemble the Cybermen - also being pushed fairly heavily at the time - so the reptilian side of their nature ended up being dominant in their costumes. 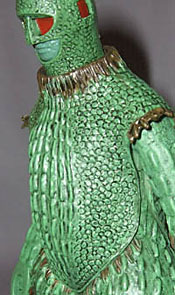 At first glance they seem to be a strange hybrid lizard/insect, with a shell-like exoskeleton, but in fact aside from the exposed mouth, everything you see on a Warrior is ornate armour (fiberglass, in fact) - later Expanded Universe stories retconned the notion of cybernetics back in by making it powered armour, linked directly to the wearer's nervous system. They're also notable for doing the Klingon enemy-to-friend thing well before the Klingons: their first two appearances had them engaged in every alien race's favourite pastime of Conquering The Earth, but later - in Jon Pertwee's run (which also gave them colour, although the green had been largely assumed anyway) - a couple of trips to the 40th Century showed that they'd settled down and joined the Galactic Federation, alongside humanity, and (excluding a renegade faction that popped up) were a noble and honourable race. You can see why the Doctor got a bit of a shock on seeing their ambassador at that point though - even ignoring his unpromising past history with them, the Ice Warriors aren't the most friendly-looking bunch. 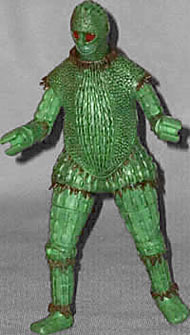 Their action figure recreates the classic Warrior - of their first serial, aptly named "The Ice Warriors" (in later stories they sported cylindrical sonic blasters on their forearms) - in commendable detail, towering by Doctor Who standards at 6", and covered in two primary layers, the jointed limb coverings, and the heavy, rotund torso carapace, with the helmet poking out the top. All of the armour has had a paint wash applied - on the shell it brings out the fine detail of the scales, covering the raised ridges at the front, the small scales around it, and the larger tortoise-like pattern on the back, while on the smoother limb segments, besides clinging here and there to the ridges, the paint mainly serves just to dirty the surface up a bit, making it seem less toy-like. All the joint areas feature painted "fur," which was present on the costume - simplified at this scale, naturally, but a decent approximation. The head is treated much like the body - being mostly covered in the same armour, no surprise there. Depending on the actor and costume - several were made - the heads varied from poking up quite a way above the carapace's neck, like this figure's does, or settled down in it like a tortoise hunkering down for some quality ignoring-everything-outside-the-shell time (they also did that when they overheated; in "The Seeds of Death" one of them, barely still functional, had withered so far his nose was barely peeking out above his neck). The head also sports the shielded eye and ear holes, covered in red plastic - just dark red shiny paint here, but the old costume helmets didn't let much light through, so the solid colour does the job well - and the mouth, which on the Warriors was also provided by the wardrobe department, giving them a humanoid but heavy, brutish look (they didn't move too well either, which was problematic when a Warrior needed to speak - the Ice Lords in their less bulky outfits got skin-applied makeup rather than "mouth masks", though they still had to do the breathy, hissing voice). Articulation is nearly standard for the Doctor Who range, which means this figure is a whole lot more mobile than a real Ice Warrior - they'd provide real competition for the Hammer Horror Frankenstein creature in a 100m Lumbering race. They lack waist and bicep joints, and the ankles can't tilt, but are unencumbered elsewhere: swivel neck, swivel/pin shoulders, pin elbows, swivel wrists, swivel/pin hips, swivel biceps, pin knees and the aforesaid swivel ankles. True to the costume the carapace has very wide clearance at the shoulder and hip joints, but it's also made from soft plastic if you really must swing their limbs out wildly - the poor old actors in their fiberglass didn't have that luxury. No accessories for Marvin the Martian, sadly - a sonic blaster would have been nice, but since those were mounted directly on the forearm (since their big claw hands can't hold a damn thing) that would've required a socket for the blaster to fit into, which in turn would've been visible if you wanted your Warrior in his unarmed state. If Character Options, in their exuberance, decide that this isn't enough Ice Warrior for their fans, it wouldn't be a surprise to see an armed version (akin to the armed/unarmed modern Cyberman variants), perhaps accompanied by an Ice Lord; I certainly wouldn't complain. 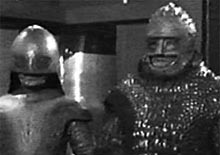 The Ice Warriors really are the also-rans of Doctor Who - far more than the Sontarans, who, if they didn't hit it big like the Daleks and Cybermen, could probably still ride their coattails into the cool parties. They may look ungainly (although there's plenty of retro-cool in their design, so it won't just be the die-hards buying them), but they were a complex and interesting race by anyone's standards, and their action figure does them proud.